Last year, I had a correspondence with a lady who happened to be the Publicist of Chef Richard; Dwayne Wade’s private Chef. She wanted me to try a few recipes from his book and I just had to. Come on, this guy cooks for the beautiful Gabrielle Union and her basket baller hubby. Have you seen them? Fresh as can be. He has to be doing something right with their diets. I went through the book and all the recipes looked amazing but something kind of stood out to me. Some of the recipes reminded me of Nigerian recipes. I think it was the Creole part that kind of reminded of home. The precision and spices did it for me. 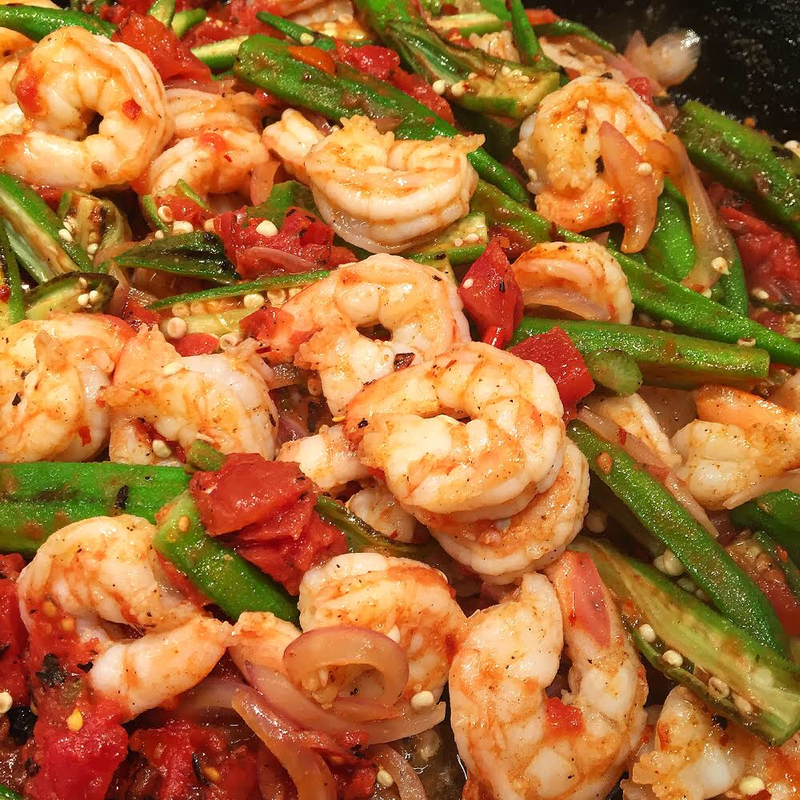 I tried two recipes, but my favorite was the stewed okra with shrimp. when I first saw the photo and the recipe, it was immediately love at first sight. I did not just love this book and the recipe because it reminded me of my mom’s pot of okra, but because it tasted and smelled so fresh. And I said to myself, D Wade and his wife have a gold mine on their hands. No wonder he plays the ball amazingly. After a bowl of okra, even an armature will play basket ball with ease. Not only was the recipe exceptional, it reminded me of my Nigeria gumbo with okra. And trust that with seafood, it was all that in a bag of potato chips. If told to recommend any book that is simple and kind of fuses different cultures in one without any fuss, “Eating Well to Win“ would be the one. Not only are the recipes simple and significantly healthy, you would be too spoiled for choices to even know what to make from the book. Dwayne wade and Gabi, na this food una dey enjoy since. No wonder Gabi looks so youthful. She has been enjoying whole full dishes. and her husband…oh my! I would love to share the recipe for the okra here, but what would be the point of asking you to go get his book? This entry was posted in Uncategorized and tagged chef ingham, dwayne wade, eatig healthy, eating well, gabrielle union, Nigerian food blog.